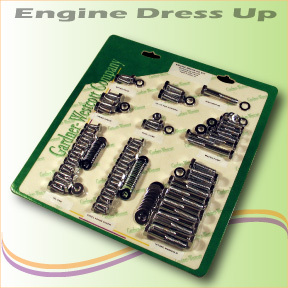 These Ford Oval Kits for 429/460 engines contain chrome engine dress up bolt(s) for: Intake Manifold, Valve Covers, Water neck, Timing Cover, Fuel Pump, Oil Pan, Headers (Water Pump NOT included) Washers supplied where applicable. NOTE: Please specify aluminum or steel Valve Covers when ordering. FREE Shipping in USA!